All too often, building construction fails to find a sympathetic balance with its surroundings. This has not been the case with the Lideta Mercato shopping mall in the Ethiopian capital, Addis Ababa, built by XV Studio, the firm of Catalan architect Xavier Vilalta. 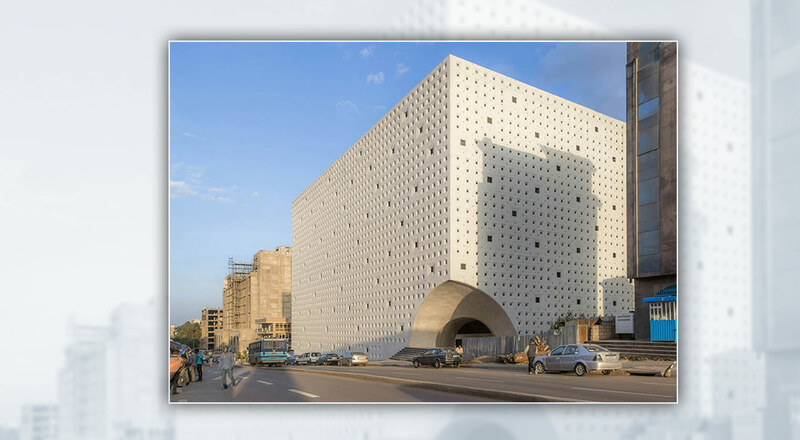 The shopping mall project came about from an analysis of the existing shopping malls in the Ethiopian capital, which are designed along the lines of Western shopping malls, with oversized shops, and glass facades that create excesses of light and heat in their interior. But, the XV Studio construction has a very different concept. ‘I wanted to achieve something that the person in the street with no knowledge of architecture would understand’, explains Vilalta. This is how the idea for the facade came about: A fractal design reminiscent of the patterns of traditional Ethiopian stamped cloth, and which provides protection from the sun and the rain, and allows for ventilation and natural light in the interior. Vilalta believes that ‘when you do something in a certain place you need to find characteristics that somehow belong there, and use them’. The urban nature of the site’s surroundings also played a part in influencing the shopping mall’s final design. Being located between two parallel streets with no connection between them, in a neighbourhood with no public spaces, and surrounded by high-density urban development, XV Studio considered it necessary to include an interior diagonal corridor to facilitate pedestrian movement.